After just a few short months working on this house, I have grown to love it and cherish it but sadly it’s time for us to say goodbye. If you haven’t been following along on the journey of the Flip House, this is our very first one! I recently quit my teaching job to flip houses full time and I’ll be honest, these past few months have been the best time of my life! I feel like I have finally found what I was created to do. It feels so natural and I haven’t regretted this decision (well…maybe a few times ;) it’s not the easiest kind of work and a lot of stress comes with it!). We have finally put the house on the market, which means it’s time for before and after pictures! I am completely blown away by the transformation. The house was built in the 60’s so you’ll see how outdated it was. The house already had a new(er) roof, brand new windows, newer water heater/furnace, and the foundation was in great shape. It was so nice not having to replace all of those things due to how expensive it can end up being! It was a dark and very cramped space when you walked in the front door. Taking out the half wall, replacing the light fixture, and giving everything a fresh coat of paint really brightened the space and updated it. It’s so important to have a nice entryway…the first impression says a lot about a house! Everything in the dining room was very dated…the china cabinets, the light fixtures, and don’t even get me started on that pink carpet. We knocked out the wall between the dining room and the kitchen to open up the space. We added a new light fixture, and painted the walls a light gray. OKAY. This was one of my favorite parts of this whole transformation. I absolutely love this kitchen. We took out the existing cabinets, installed new ones, put in new Carrera Marble countertops, put in the island, and updated all the appliances. Every square inch of this kitchen was remodeled! It is perfect for entertaining and i’m a bit jealous this isn’t my kitchen. This room is a breath of fresh air. The fireplace and all the trim was painted white, and the paneling came off. The fireplace received a much needed facelift. It was an easy and cheap fix to update it-I just painted everything and Stuart made me this beautiful mantle! We took out the upper shelves and replaced them with shelves that Stuart made to match the beams in the kitchen. My dad made new modern doors that I primed and painted and then I added some simple knobs to update the hutch. We had the kitchen countertops installed on the hutch as well to also tie into the kitchen. It’s the perfect place to store books, knickknacks, or your keys! Ahh I love a white and bright space-especially in a laundry room! This space would definitely motivate me to do laundry more often… ;) We added the shower and a pedestal sink in this space, painted, added new tile for the floors, and added a bench. I love how it turned out! This bathroom was ALL PINK. We replaced the floors, toilet, light fixtures, vanity, and bathtub. There was a single sink before so we turned it into a double vanity giving a family with kids a lot less stress for getting ready in the morning or for bed (or just a ‘his’ and ‘hers’). There wasn’t a whole lot to do to the bedrooms. I painted them all white, put in plush carpet, and put in all new trim. Little things can make a big difference! We had new carpet installed, painted the bead-board, trim, brick, and wallpaper. This is my favorite room in the whole house! I could definitely see many birthday parties, morning hangouts, lots of coffee drinking, and reading a book on a rainy day out here in this space. 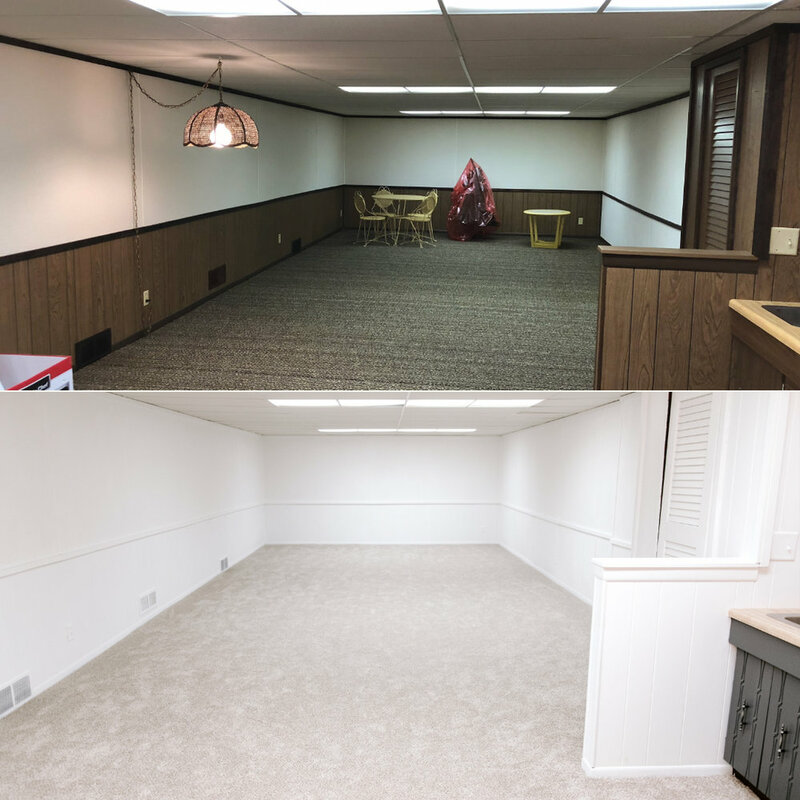 New carpet and fresh paint was all we needed to update the basement. Now it’s a happier place for the kids to hang out in! 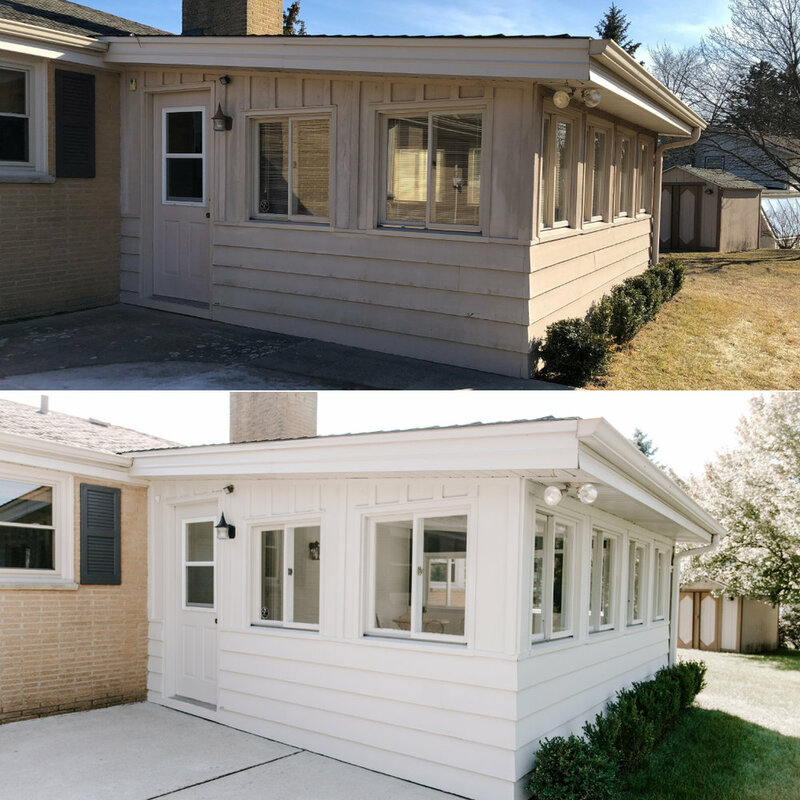 All the outside needed was an updated color on the shutters, and a fresh coat of paint on the sunroom. I am so thankful for this new journey in our life. We have learned so much through the process and we cannot wait for our next house. Thank you for following along with us!